Cutting and piecing is simple and fast. Stacking fat quarters make cutting a brees and there's no wasted fabric. Great for group projects and perfect for beginners or kids. 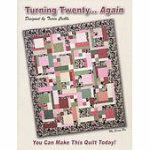 You can change the size of your quilt by simply adding or taking away fat quarters.